Part of From the Vault. Part of Pan-African Liberation. A Luta Continua explains the military struggle of the Liberation Front of Mozambique (FRELIMO) against the Portuguese. Produced and narrated by American activists Robert Van Lierop, it details the relationship of the liberation to the wider regional and continental demands for self-determination against minority rule. It notes the complicit roles of foreign governments and companies in supporting Portugal against the African nationalists. 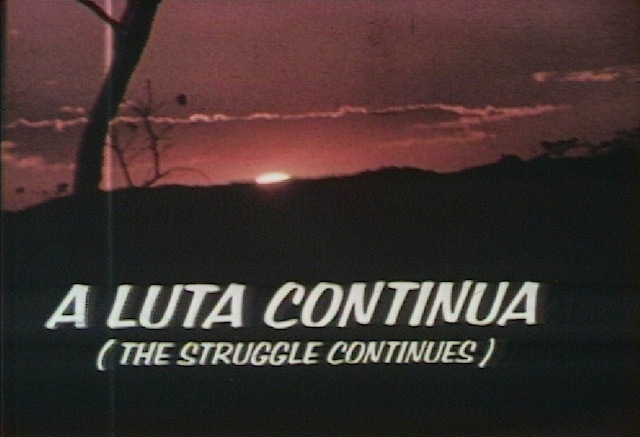 Footage from the front lines of the struggle helps contextualize FRELIMOs African socialist ideology, specifically the role of the military in building the new nation, a commitment to education, demands for sexual equality, the introduction of medical aid into the countryside, and the role of culture in creating a single national identity. Summary and select metadata for this record was submitted by R. Joseph Parrott. Guests Caroline Hunter, Dinizulu Ceitou of Boston's African Liberation Day Committee and Christopher Nteta of the Pan African Liberation Committee discuss the liberation struggle in Mozambique with host Topper Carew. Topics include Frelimo (the African freedom fighters in Mozambique), the influence of Black American support on the cause, the relationship between corporations and the seizure of African land, the need for violence to achieve liberation, the relationship between racism and colonization, and the need for Black Americans to recognize that the African struggle is their struggle. Program includes a 30 minute film titled "The Struggle Continues (A Luta Continua)," which documents the work of the resistance. Chicago: “Say Brother; African Liberation Committee Film; A Luta Continua (The Struggle Continues),” 10/25/1973, WGBH Media Library & Archives, accessed April 18, 2019, http://openvault.wgbh.org/catalog/V_7E8FD3E200F84CC3ABEE5D8CCC94FD12. MLA: “Say Brother; African Liberation Committee Film; A Luta Continua (The Struggle Continues).” 10/25/1973. WGBH Media Library & Archives. Web. April 18, 2019. <http://openvault.wgbh.org/catalog/V_7E8FD3E200F84CC3ABEE5D8CCC94FD12>.